Can true love save your life? 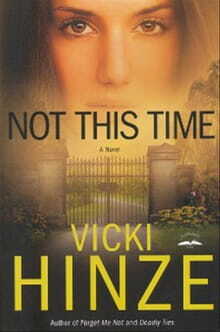 It does in Vicki Hinze’s latest romantic thriller, Not This Time. The affections Hinze develops between two of her main characters cleverly become a crucial tool needed to outwit a potential killer. In Not This Time, romance isn’t for wimps. But it is multi-purpose. A close-knit community in a sleepy Florida town has been stalked by terrorism in the past. And it appears history may be repeating itself. Beth, our protagonist, co-founded a technology firm there with her best friend, Sara, and one of their best clients is the FBI data center in Quantico, Virginia. Suddenly the town finds itself plunged back into the epicenter of a renewed terrorist campaign focused on Beth and Sara’s company. When Sara’s husband goes missing after a chemical attack at a wedding, everyone fears the worst. Beth never liked Sara’s husband, and everyone knew it. Then again, nobody in town liked him. But murder? Both Beth and Sara have too much invested in their company. And chemical warfare didn’t fit any local person’s M.O. What starts out as a search for his killer turns into a desperate race to stay ahead of the real terrorists living right in their midst. Maybe it’s the adrenaline juiced up by all of the excitement and danger, but Beth finds herself falling for one of the federal agents working the case. Some of Hinze’s dialogue between them sounds less like a conversation between two professionals as it does two teenagers, especially since their romance is just about the only part of the plot that has no suspense whatsoever. Even a third of the way through the book, it’s obvious they’ll have ended up together by the last page. But it’s this solid romance that gives Beth all she needs to know to eventually realize an imposter has gotten too close. An imposter whose presence tips off a fast-paced, page-flipping chase to keep Sara from being murdered. The spiritual analogy at this point shouldn’t be missed: developing a close relationship with Christ can keep us from falling for dangerous things that mimic his salvation in the world. And on the subject of theology, of which there’s a good amount, the fact that Hinze’s tends towards Free Will shouldn’t ruffle the feathers of Reformed readers. Its presence means the characters are interacting with God and sharing their faith with other characters in the story—two qualities I’d expect from a book aimed at a Christian audience. Nobody still ever seems to have daily devotions, but Christ’s salvation message rings through loud and clear, particularly towards the end. Not This Time is as much about second chances as it is taking a stand against evil. Although books of this genre are usually geared toward a female audience, Hinze develops enough action and plot twists to keep readers of both genders engaged. Its jumble of characters can seem a bit confusing, but every mystery needs a large supporting cast to keep us guessing. If you were to suggest Not This Time to the man in your life, he probably won’t find it that easy to put down. After all, love that can save one’s life isn’t just for women, is it?